Monday, 1pm CT—Houston remains in the midst of Hurricane Harvey’s devastating aftermath, and we are weeks if not months away from a full accounting of its toll on the fourth largest city in the United States. And while a definitive account of its epic proportions will have to wait, we can at least begin to make some preliminary assessments. In this post we will discuss how Harvey compares to other major flood storms in US history, and also how it stacks up to the region’s previous flooding event of record, Tropical Storm Allison. (Spoiler alert: Allison had a good run, but Harvey has forever dethroned her). Note that the initial estimate for Harvey may be too low. As of Monday morning, Neilsen-Gammon’s hand estimate for Harvey to date was 3.1, but more heavy rains were falling in the target area and a full five days not reached. Already, for 72 hours, Nielsen-Gammon said Harvey is the greatest event over this shorter time scale. Under this metric of rainfall over a large area, then, Harvey will very likely produce the greatest total amount of rainfall in the United States from any single storm, at least during the last 120 years. (the Gulf coast is by far the most susceptible US regions to such events due to its proximity to the warm, humid body of tropical water). Tropical Storm Allison remains the costliest US tropical storm in history, with $5 billion in damages. Harvey won’t change that, because it came ashore as a hurricane. However, in all other respects Harvey will easily eclipse Allison. Consider the following, five-day rain totals from Allison for Harris County. 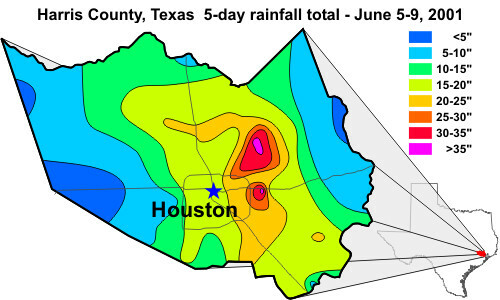 Note that only a small area of the county received 25 inches or more rainfall during the five-day period (shown in red and purple). According to Rice University’s Phil Bedient, who spent the better part of a decade studying Allison, the rains were spread out over the period. For example, one day Conroe might get hammered, then Sugar Land, and so on. Even during the final night, the area of heaviest rains—about 15 inches, in total—was confined to the area inside Loop 610, with the higher totals near downtown and the Texas Medical Center. The principal difference between Allison and Harvey is that the rains have fallen across the entire county. 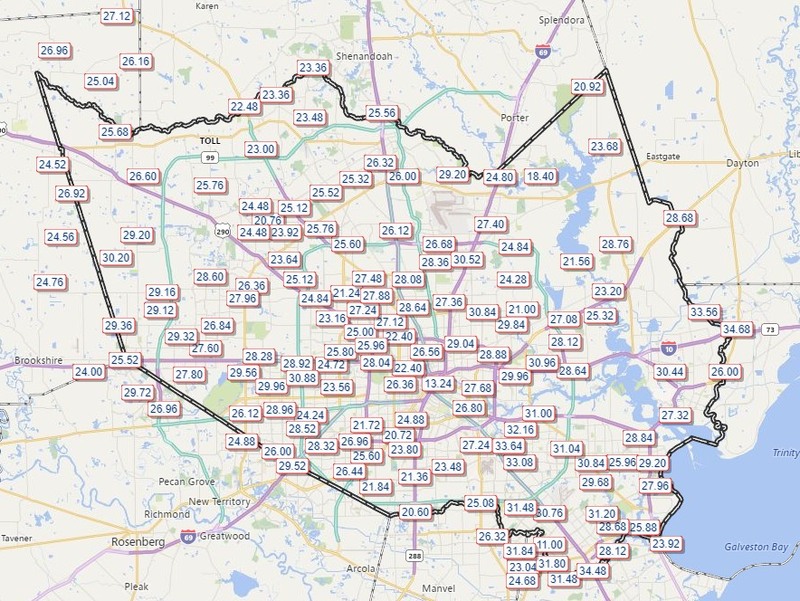 According to Jeff Lindner, with the Harris County Flood Control District, the county has averaged 23.7 inches of rainfall during just the last 48 hours, a two-day period compared the the Allison map above. And virtually every part of Harris County has gotten at least 25 inches during the last three days. This map is really rather astounding when you compare county-wide accumulations of 25 inches over just three days to the small area of 25-inch accumulations during Allison spread over five days. The other factor to consider when trying to ballpark damages is the fact that the Harris County population in 2001 was about 3.5 million, and it has now grown to 4.5 million (or more), with an exceptional amount of development on the west and southeast sides of the region, which were among the hardest hit areas. “The damage estimates are going to be astronomical,” Bedient said. Undoubtedly. How can we get updates on when the barker reservoir will be dumping water? You can watch the sensors, but you cannot find a schedule or their plans? The US Army Corps of Engineers has been providing updates via Facebook. Do you see anywhere in the metro area getting a break today? Matt will have a forecast update out soon. 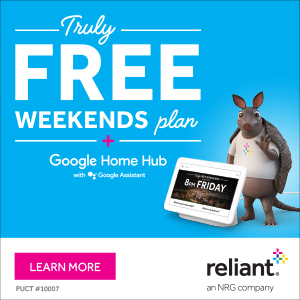 Only to try to keep some levity….but leave it to Texas (Houston!) to do it bigger!! And the biggest thing Texas does is help those in need. I am amazed, but in no way surprised, to see all the private citizens out with boats and helping hands. All kidding aside….Please everyone be safe. Hugs to your friends and family members. Any insights that will help Katy residents deal with the uncertainty of Barker will help! I love your posts and really appreciate the hard work you do. However, I am not alone in thinking we have been anxious to get an afternoon update that doesn’t help us understand and get a better picture of what’s going on from our most trusted source. This morning’s post mentioned we would learn more in the afternoon. I honestly don’t think people want to read the above at this point. Ask yourself why you think you would ever want to stay if you can “barely get out now”. To be following Eric it means you’re already very wise. Try to stay logical and make your best decision. Thanks so much for your work and the no-nonsense update. Do you all think the worst is behind us? Revised the title twice now? What’s the forecast for more title revsions? Should we expect significant title revisions tonight or through Wednesday? Should Katy evacuate? Revised the title twice now? What’s the forecast for more title revsions? Should we expect significant title revisions tonight or through Wednesday? Should, I dare to say, Katy, Texas evacuate? This doesn’t help anyone at this point!! In fact it contributes to people’s stress. Many of us follow this blog specifically for the scientific and statistical information. How this storm compares to other catastrophic ones in the past is certainly of interest to many at this point. Don’t shoot the messenger. Keep up the great work, Eric and team. Aaron, the entire nation is watching. The rest of us that aren’t there need to understand the magnitude of what’s going on so we can help. That’s why I’m reading this article. Thoughts and prayers are with you all. PERCENTAGES Good future discussion issue is percentage-wise how bad has storm been, for persons and business/economy, which bears on future evacuation decisions and whether Houston businesses will suffer severely – – which are 2 big future questions we all face. If like with storm Allison as Wikipedia says there were 70,000 homes damaged and 3000 which due to water/mold/foundation will be considered destroyed, if housing stock is 3m homes this is 2% and .1%. Maybe businesses have similar numbers. This seems not terrible, like a tornado in a county it left most people untouched but partly wrecked a line of homes. And respectfully, half of those homes were known to be in low spots. Roads of course have spots flooded maybe for a week, so “week of road disruption” seems the worst effect of major rain event for Houston. Another number is persons in shelters, and 5000 people who are in shelters due to water a few feet high for a week, in a city of 5m, is .1%, so not too terrible. And as Ike showed, Houston itself seems to survive hurricane “wind” effects fairly OK, except again for maybe .1% of buildings which are torn partly apart. Overall, I feel happy by these numbers that Houston is not a doomed city, and I think never evacuate Houston since water and wind will rarely kill Houston people. Please don’t say it is heartless to minimize the “catastrophe” for the under 1% – – being nice with words is free and does no good, and show you care by giving 10% tithe to church and charity. Hey everyone!! Settle down with attacking Eric. Of course everyone is stressed but please take a breath before you bite the hand that has been generously feeding all of us. Would you provide this info at such regularity so generously. It’s not fair and we are all better than that. You guys are great !!! This is great historical info, but we really need further info about the reservoirs. Please update as soon as you know more. Thank you so much! We are hearing that Dickinson has issued mandatory evacuation orders. What is happening that is leading to this? Do they see something coming that the general public doesn’t know about? We are in Tuscan Lakes in League City, which is not far from Dickinson. Just wondering how this might affect us. How’s Tomball doing? Any of the blog readers have an update on the weather this afternoon and tonight? Heavy rain? As a proud Iowan and new fan of your website, I am flabbergasted 1993 is not part of the biggest Mississippi River Flood Discharges? Any reason why beyond it being a handful of major rain events at once until the ruins of July 11th-13th 1993 that later ruined the Ruan Grand Prix? Thank you, thank you, thank you. In the absence of predictability during this storm, I appreciate your consistent and persistent updates in keeping us informed and in touch. Minor question, but, could that 13.24″ total from downtown really be accurate? Seems wildly out of line with every other gauge. Thank you for your updates. We’ve been on the website since Friday and it’s great to finally find a source of information that is straightforward and as reassuring as one can be in a time like this. We’re up here in Spring (well north of the disaster area) and are slowly watching water creep up to our mufflers, even at the highest point of the driveway. Desperately hoping for this rain to abate soon! !